Use the slope and y-intercept of a straight line to derive its equation. 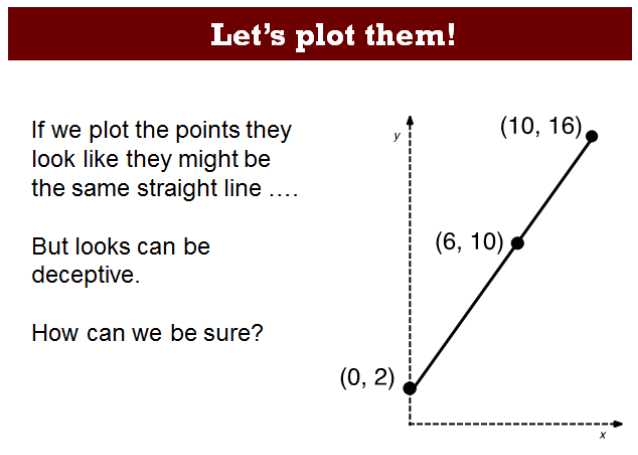 Students may use the properties of similar triangles to achieve these goals. After a whole-class introduction, students work in small groups on a collaborative discussion task, matching cards that describe the same line. Throughout their work, students justify and explain their thinking and reasoning. Students review their work by comparing their matches with those of their peers. Each student will need a mini-whiteboard, pen, and wipe, and a copy of the assessment tasks Lines, Slopes and Equations and Lines, Slopes and Equations (revisited). Each small group of students will need a cut-up copy of the Card Set: Lines, a pencil, a marker, a large sheet of poster paper and a glue stick. 15 minutes before the lesson, an 90-minute lesson (or split into two shorter ones), and 15 minutes in a follow-up lesson (or for homework). These timings are not exact. Exact timings will depend on the needs of your students.